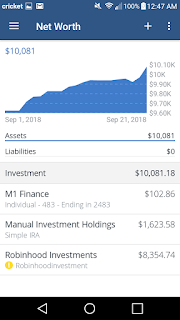 I've recently crossed what I believe to be quite a milestone for anyone that is pursuing financial independence. After over a year of saving and investing my excess capital into my portfolio of mostly dividend growth companies, I have reached $10,000 in investments with no debt. Why is there an emphasis on the investment aspect of net worth? Well, that's because a $10,000 car or $10,000 of furniture doesn't have the same effect as $10,000 in investments. A $10,000 car will get you to work quite reliably, but a $10,000 portfolio will generate hundreds of dollars of growing income on an annual basis. My money is starting to work for me! Whether you're 21 years old or 41 years old, I believe my story could give you a few key takeaways on how I reached this milestone, and how you can too. Or if you've already passed this milestone months or years ago, this could serve simply as a reinforcement of your beliefs. Without further ado, let's dive straight into the reasons I was able to achieve this milestone. As I alluded to in (How I've Avoided Student Loan Debt), I've been incredibly fortunate to have supportive parents. If it wasn't for my parents, I would be at least $10,000 in debt rather than worth $10,000. I want this site to be completely transparent, and I think it would be a terrible act of omission for me to not mention that my parents have let me live with them rent free. To act as though I have achieved this entirely on my own would be intellectually dishonest. It's this support from my parents that will allow me to graduate debt free with my undergrad degree in accounting next summer. As I've said before, graduating college with little to no debt is virtually the first step on the path to becoming financially independent at an early age. The basic lesson from this is that if you're able to, live with your parents while you are still in college. This will set you up very favorably once you graduate college, and you'll be leaps and bounds ahead of your peers on your path to financial freedom. When you don't have any debt upon graduating college, that leads us into the second component of turbocharging your wealth building. Although my parents have been incredibly generous in letting me continue to live with them, this didn't actually guarantee that I would reach $10,000 in investments at the age of 21. There are only two "levers" to pull to increase your net worth and build wealth. The first of which is to keep your expenses under control. Life is full of choices, and when you're in your 20s like I am, there are often many terrible choices readily available for you to make. The absolute worst choice you could make that has led to the metaphorical and literal demise of many promising young lives includes drugs and alcohol. Fortunately, I've never been the sort of person that is naturally inclined to go out "clubbing" or partying. Not only is it not healthy for the wallet, it's terrible for your health. Society tries to make you believe that these acts of going out and getting intoxicated are really "living," but I believe that to be absolutely false and marketing propaganda used by nightclubs/bars and alcohol companies. The crux of the matter is that when you avoid doing stupid things like seeking to impress people or engaging in "vices," it generally isn't very difficult to save money and get started on the path to financial independence. By doing the above, and by keeping the "Big 3" expenses (i.e. housing, food, and transportation) under control, saving money is very doable. While I talked about one of the two "levers" you can pull to build wealth, I didn't want to leave out the second which is increasing income. Building wealth can really be this simple. Just before I graduated college in August 2017, I accepted my first "real" job and current job working in the legal field. Before this, I was working part-time as a cashier making barely above minimum wage. Since starting my current job, my pay has increased with 3 raises from $10/hr with no benefits to about $12.75/hr including benefits. Obviously, this has been quite an increase from the roughly $300/month I was making while still attending my 2 year college. This has more than offset the increase in expenses I have experienced since obtaining my 2 year degree, and subsequently starting my current job, as my current expenses with tuition/textbooks/living expenses have increased about $1,400/month while net income has increased $1,550/month. When you're in the early stages of building wealth like me, having supportive parents is very helpful. I have been very blessed to have parents that allow me to live with them (and that put up with me lol). If you don't have this support system, it isn't impossible to build wealth, but it's certainly much more difficult! Moreover, the easiest way to begin building wealth is by avoiding debt. I'll be graduating next year with no debt. The final takeaway is pulling the two levers to build wealth. You can either decrease expenses, increase income, or do a bit of both. You can decrease your expenses and keep them under control by refraining from nonsense like drugs/alcohol/gambling or trying to impress others, and by focusing on minimizing your "Big 3" expenses. Lastly, you can increase your income through developing additional skills or taking up a side hustle. As my friends over at DividendDiplomats say, every dollar counts on the journey to whatever dollar amount you are aiming for. Have you saved your first $10,000 in investments? If so, how long did it take for you to reach your first $10,000 in investments? How much easier was it to accumulate the next $10,000 once you had your wealth building on autopilot? Do you have any other advice to those seeking their first $10,000? I love it Kody, I love it. #1 was awesome to read about and having that backing by those that love you is crucial. But in all seriousness, all three are excellent reasons. Now rinse and repeat here. Keep going and keep on hustling. When you make more, avoid that lifestyle creep. You've got an excellent foundation to build on and will hit 100k before you know it. Thanks for the encouragement, Bert! I'm very fortunate to have a supportive family not to mention the support of this community. It's bloggers like you that that push me to make every dollar count. Congratulations on saving your first $10,000, Kody! I think it is an important milestone to be proud of. It's even more impressive that you don't have any debt. You're doing well and have such an awesome foundation. You are way ahead of me. I originally saved my first $10,000 by around 27. I kept building the until 29 but then I took a year off. In turn, the money dwindled and now I'm around the same level I was at 27. I'm 32 now. You're doing great man. If you keep it up until my age, you're going to be in an amazing position. I'm hoping to be a lot further ahead in 10 years too. Thanks for sharing! Thanks for the comment, RTC! You're absolutely right that the first $10,000 is an incredibly important foundation that needs to be built. You can't reach the first $100,000 without first reaching the first $10,000.